NEWS LIVE: This report contains news live as it develops and is being updated continuously. Bookmark and refresh the page periodically for updates. Last update: 12:12 a.m. MDT Monday. 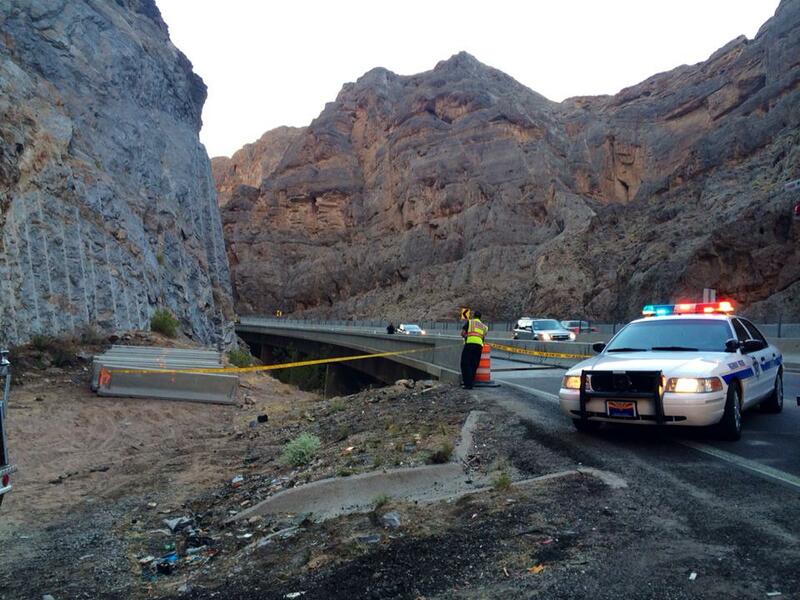 VIRGIN RIVER GORGE, Arizona — A private airplane crashed upon a ledge in the Virgin River Gorge at about 7:35 p.m. Mountain Daylight Time Sunday in the area of Interstate 15 at mile post 13.3 – 4.7 miles north of Littlefield, Arizona – just beyond the northbound entrance into the Virgin River Gorge. 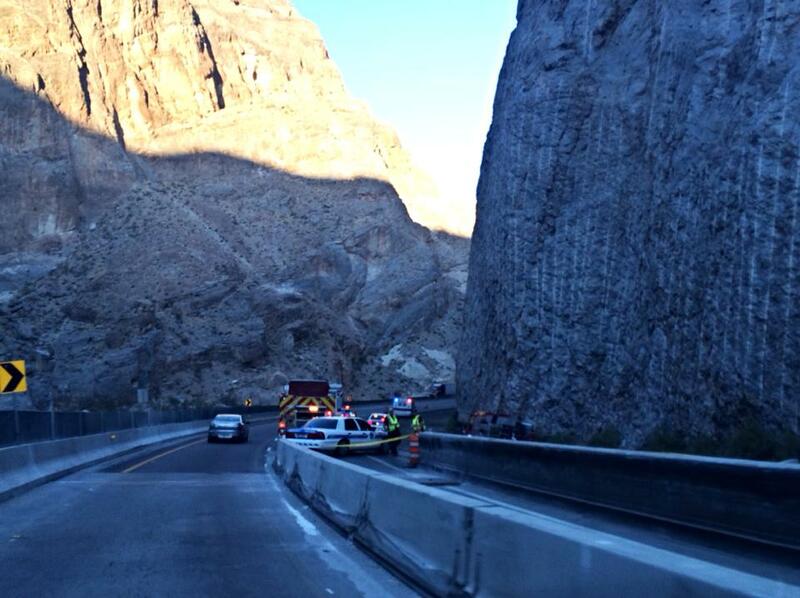 At 9:30 p.m. MDT traffic was not blocked and was moving through the Gorge. 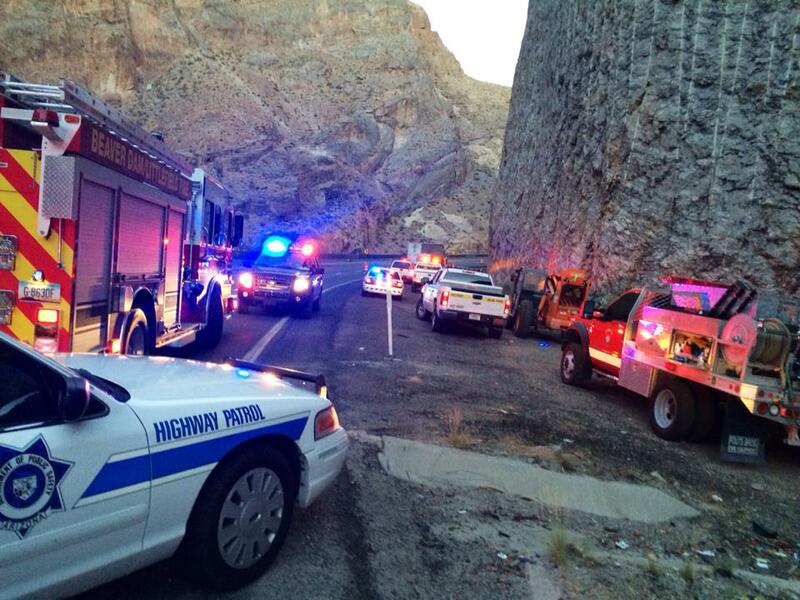 Two deaths have been confirmed by the Fire Department, Arizona Highway Patrol Sgt. John T. Bottoms said. The bodies are burned beyond recognition, so responders are not yet able to determine gender. It is believed the people died on impact, he said, not from the fire that occurred afterward. About 75 people are on scene as witnesses to the crash, a couple of who were able to climb up to the crash after it occurred. Billy and Dawn Brents, from Arkansas, were traveling I-15 through the Gorge before the plane crashed. Fire fighters climbed the mountainside to get to the fire and were still addressing flames at about 8:45 p.m. MDT using bladder bags to extinguish the fire. The plane was a small 4-seater aircraft. The tail number is partially burned, so responders have not yet identified where the plane was flying from. “At this time the only thing I can confirm is that there is a downed aircraft in the gorge,” a Public Information Unit officer of the Arizona Department of Public Safety wrote in an 8:20 p.m. MDT email. 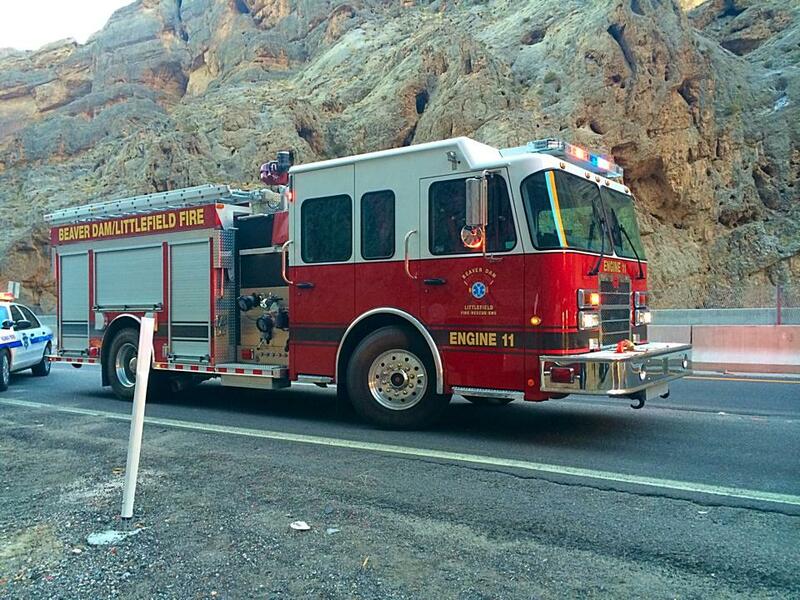 Responders from the Beaver Dam Fire Department, Mohave County Sheriff’s office, and Arizona Highway Patrol are currently on scene. The Federal Aviation Administration will conduct the crash investigation. This report is based on preliminary information provided by law enforcement or other emergency responders and may not contain the full scope of findings. It is being updated as information is being received, and readers may refresh for most current information. 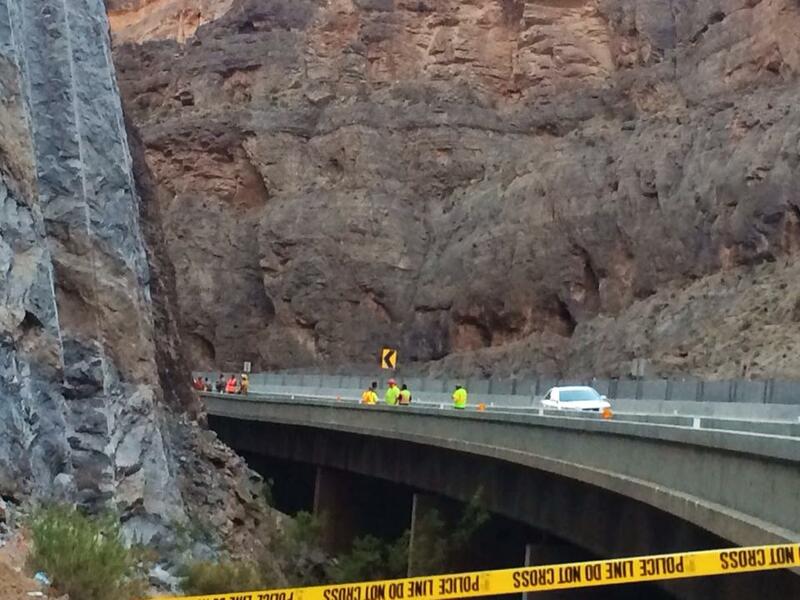 St. George News Editor-in-Chief Joyce Kuzmanic and Reporter Drew Allred contributed to this report. Prayers go out to the families. Seems as though they ALMOST made it out of the gorge. (((Hugs))) to their families. Wow. This has been a … of a week for St.G news. Very sad. Thank you Billy Brents, we received your wife’s email and the report has been updated with her comment and photo. The owner of this aircraft, D&G Aircraft Leasing in Bountiful, Utah, is affiliated with G&B Investment Management, Inc.of Bountiful. 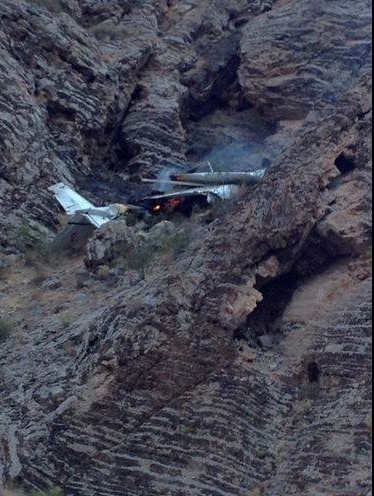 G&B was the registered owner of another Cessna 172 which crashed in Wendover, UT in 2011 and killed four. I flew the gorge top to bottom in C-177 the 1970’s with my brothers early in the morning. I asked the pilot, what happens if the engine quits. He said we will land on the highway. Now as a pilot, I would not do it now even in a jet. A-10 miltary jet crashed in there a few years ago. There is just too much wind and wind shear. I’ve had an engine out and there is literally three seconds to decide where to put the plane down. Then I was on the ground in five seconds. I would say that wind and density altitude played a part in the plane crash. Hot weather takes away at least 30% of a plane’s overall all performance. I feel sad for any family that looses a member in a plane crash, especially so close to home. These small Cessnas are known for fuel issues. I’m thinking they experienced engine trouble (failure somewhere in fuel system) and were looking for a stretch of highway to land on but didn’t make it perhaps due to the gusting winds. Yes, a well know issue with smalls Cessnas. When the fuel is exhausted the engine stops. Are you privy to any other technical insights into “these small Cessnas”? I don’t normally waste time responding to smarta…. * but running out of fuel is only one possibility. There is mechanical failure, blockage, tank failure and water in the system from condensation. To name just a few. So these failure modes are all unique to “small Cessnas”? That’s some smooth investigative work into “small Cessna” fuel problems there ST. GEORGE RESIDENT. I need a root canal, can you Google that expertise up and then come over and fix my teeth? The Cessna 172 is only one in a family of single engine light aircraft made by Cessna. The 172 has been in production, on and off, since the 1950s and there have been almost 50,000 built. Like every airplane every built there have been mechanical issues with different years and models. These are generally quickly identified by the manufacturer and/or FAA and then mandated to be repaired by the FAA. The 172 is recognized as among the safest of all light aircraft. General Aviation gets enough pass press and misinformation spread about it without self appointed Internet experts spouting off nonsense. In all likelihood this tragedy is a result of more than one mistake made by the pilot and perhaps the maintainer of the aircraft. I doubt that was the issue since they took fuel in Beaver. The Salt Lake Tribune has identified the plane’s occupants as two teenagers from Davis County. I saw drove by the crash site yesterday and had a very sick feeling for whtat the last 5 seconds of the flight might have been. Maybe they did run out of fuel, had a dead engine, or the extream wind shear, the pilot had few options, in that very narrow canyon at the mouth of the gorge. I still wonder how they ended up in the situation in the first place. They landed at Beaver to call their parents, concerned about the weather. Most pilots cross the gorge, a few miles to the north, torwards, Utah Hill at 6000 feet, to avoid the strong currents of the Virgin River gorge, that are almost always present. Perhaps being a new pilot, he did not know of the strong currents, of up and down drafts of the gorge. I still have a hard time believing that they flew down there on purpose later at sun down. In any event, there were plenty of witnesses that can tell their story as to what the last 10 minutes of the flight was. Love and deep sadness to the family. traverse. Prayer go out to these folks and their families. I saw the plane when it was at Cedar Pockets in the canyon It looked like it was descending into the canyon. At that time I had an awful feeling that the plane would not make it out of the canyon, because I was experiencing wind gusts on the ground. I have flown with my father, who had a Cessna 175 a nearly identical plane, all around the west even flying to Alaska. My heart goes out to the family of the boys, please find comfort in knowing you and your boys are in my prayers.